The colorful Fulvous whistling duck (Dendrocygna bicolor Vieillot 1816) is probably the most known duck of the group called “dendrocygns”. It belongs to the order of the Anseriforms (Anseriformes), to the family Anatids (Anatidae), genus Dendrocygna and species Dendrocygna bicolor. The name of the genus “Dendrocygna” comes from the Greek “dendron” = tree and from the Latin “cygnus” = swan and therefore it means “arboreal swan” referring to the arboreal habits of some of the species belonging to this genus and to the fact that they evoke small swans. The Latin name of the species comes from “bis” twice and “color” = colour, that is, bicoloured, with reference to the livery. Monotypic species, it’s the mostly diffused species of dendrocygn. Its home range crosses various continents and numerous islands: present in most part of Central and South America, Hawaii Islands, along the USA Gulf coast, in sub-Saharan Africa, in Madagascar, in India and in part of southern Asia. It is a mainly tropical and subtropical species and reproduces naturally in the southern and northern hemispheres in respect to the Equator. In spite of the enormous distribution of the species, almost cosmopolitan, there are no marked variations of size and colouration among the various extant species excepting the ample geographic divisions. They usually frequent swampy habitats, marshes, lakes and ponds, brackish coastal lagoons and open and plain countries; they love grassy locations with abundance of tall grass. In this genus (Dendrocygna spp. ), the dimorphism is not evident even if sometimes the behaviours and the shapes slightly heavier and more roundish (of the abdomen) of the females before spawning (or during that) may allow to distinguish the sexes to a “trained eye”. 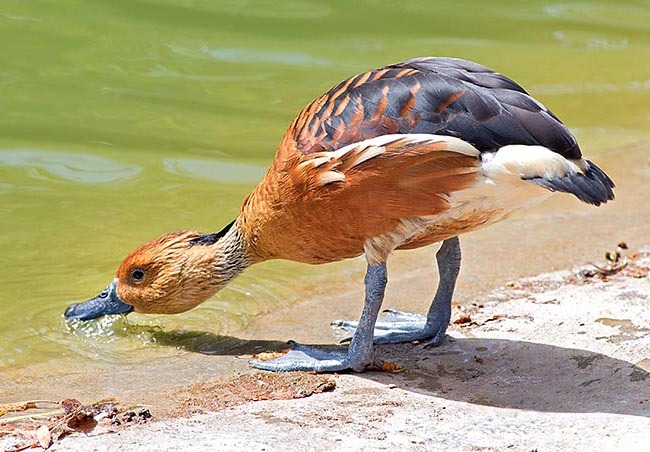 The fulvous whistling ducks have a particular conformation: relatively long necks and legs, ample webbed feet endowed of robust and sharp tails, have a quite erect posture with a more vertical trunk than the typical ducks, their gait much “off the ground” is elegant and nice. The short, wide and rounded wings with primaries and secondaries of the same length characterize all the species. In some species, the inner vanes of the external primary feathers are strongly jagged and notched and vibrate when flying generating a distinguishing whistle or a mechanical buzz. When flying, they keep head and neck slightly lowered and well spread forward, the posture is somewhat humpy; the long legs (much longer than the short tail), simulate a long pointed tail. They have a flight with rather slow and deep wing beats, the flight is a little flickering and vey nice. Many species fly also during the night. Substantially, they are plain ducks and live in warm habitats. Some species have nocturnal habits; others are arboreal, others strictly terricolous. The fulvous whistling duck has a typical Dendrocygn shape, is about 45-53 cm long and weighs about 621-755 g. The fulvous whistling duck is so called because of its rather uniform brown-yellowish-buffalo skin-cinnamon colour in most of the body: lateral parts of the head, neck, sides and abdomen. The back and the dorsal part of the neck (prolonging from the top of the head which is brown-more intense chestnut) are coloured of dark brown-almost blackish. Also the rump is dark. The coverts of the wings, also dark brown, have the terminal parts of reddish-cinnamon colour forming paler terminal caps on dark background. The ventral-lateral-medial part of the neck has a sort of a not defined spot more shaded of pale yellowish-whitish-silvery; in this part the feathers are arranged in “small tufts” forming slight stripes-small furrows in low relief. Under the just described zone, the rest of the neck, ventrally, and the chest have more yellowish-golden hues. The head ends in a small back tuft, just evident, carried horizontally and slightly erectile. On the sides are present some falciform drawings almost white, white-cream interesting half vane of the elongated lateral feathers. The under-wing is very dark brown. The tail is dark-blackish, as well as the fore dorsal part of the over-tail. The over-tail is pale, practically white cream and is evident when the bird is flying, pale is also the under-tail. 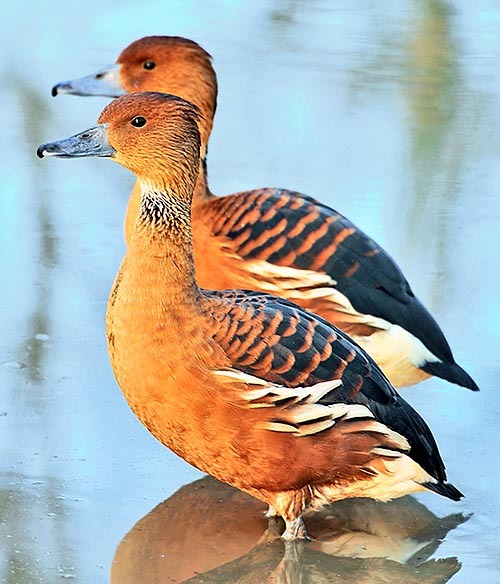 The fulvous whistling ducks have big feet, of grey colour, and amply webbed which render them excellent swimmers, more efficient than their congeners, even if, while swimming, they do not have much style and grace. The bill is large, with well pronounced nail, of grey-asphalt colour. The eye is brown-dark. In the juveniles the livery is duller and the lateral parts are less pale. This species has the habit of vocalizing a lot when flying, screeching like the plovers (genus Charadrius). The flocks, while eating, are particularly noisy so much that the Mexican populations have given the name of “screechers or criers” to this duck. These continuous whistles, very agreeable to hear, contribute in maintaining the familiar unit and the cohesion inside the flocks. This bird runs with agility and rarely perches on trees (especially in the New World). Usually it swims slowly with the head raised high; they are good swimmers even if little clumsy in movements. Despite being a little fractious species, it has gregarious habits merging in great flocks for feeding and resting in group. The fulvous whistling duck, like the white-faced whistling duck (Dendrocygna viduata) with which, at times, shares the feeding zones, has omnivorous alimentary habits, but mainly vegetarian as nourishing of various seeds and grains, sedges, herbs, aquatic plants, bulbs, tubers, fruits of various type. Especially during the reproductive season, it completes the diet with animal origin food, such as aquatic insects, larvae, slugs and crustaceans even if they are never a substantially abundant part of their alimentation. Despite being a shy duck, it is more easily approachable than other wild species. It has mainly nocturnal or crepuscular habits, does not have any problem to fly in the dark, often in irregular formation. It is very striking to be flown over, in the darkness (without seeing them or almost) by a strongly whistling flock. The species is mainly sedentary even if it can make seasonal movements and some populations can result highly vagrant. Most of the population north to Rio Grande moves southwards in autumn, so dong few specimens are victim of the American hunters, but are amply hunted in Mexico. 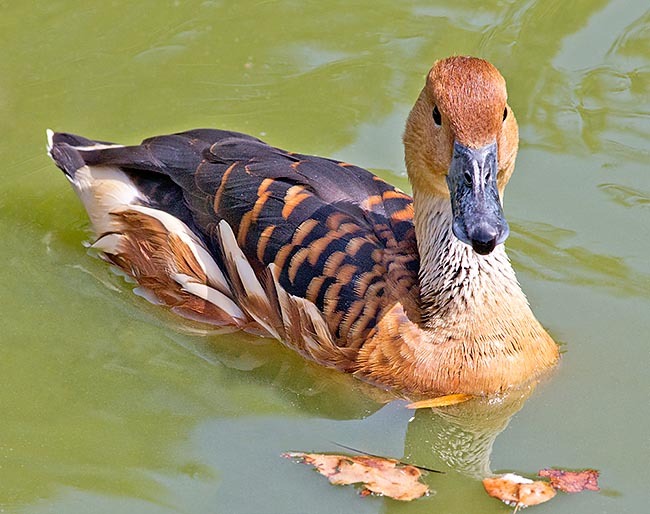 The reproductive behaviours are similar to those of the white-faced whistling duck (Dendrocygna viduata). Their nests vary from the simple depressions done in the ground or between the tufts of grass to more complex realizations having the shape of rather high baskets, at times endowed also with a cupola, and assembled intertwining and fixing long grass blades. For the nesting they may utilize also hollows in the trees of other birds’ nests. In America, the species nests mainly on the ground whilst in India it uses more cavities and abandoned nests overhead as it can nest also at some metres from the soil. At times, they realize common nests which contain many eggs. The eggs are rather roundish and are ivory white-cream colour, their average size is of 53 per 38 mm and weigh around the 50 g; the hatching lasts 24-25 days. The ducklings are hazy brown with more defined brown vertex of the head and ample lateral band, at the level of the cheek, whitish turning around the nape and interesting ventrally the chinstrap. Whitish shades are present at the level of the wing, chest and tail. These ducks are very much attracted by the rice and corn fields, and for this they may be considered as pests by the farmers who often destroy the nests of the birds. The reproductive season, in the tropical zones, begins usually by the end of the rain season. The species does not result being endangered, apart in Madagascar and in part of the Indian subcontinent. 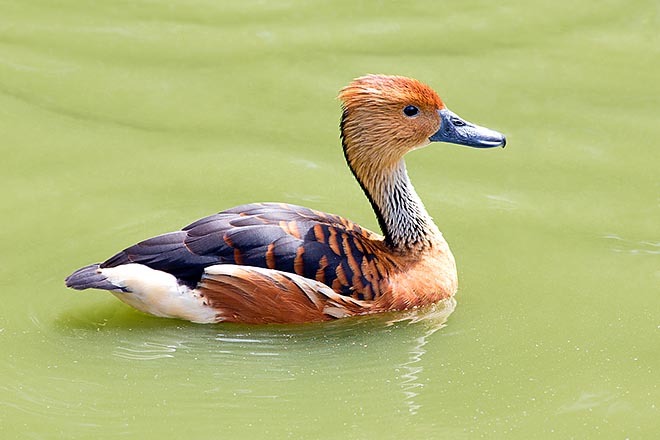 Around the sixties, in USA, there was a large mortality of fulvous whistling ducks caused by the indiscriminate use of toxic pesticides in the rice fields. Later on, with the reduction of the use of the non selective hydrocarbon chlorinated pesticides, there has been an increase of the local population even of not reaching again the great numbers as before the 1940. The American population is estimated in little less than one million of specimens; in Africa there should be reside about 625.000 specimens. The population, of about 20.000 units, is decreasing in southern Asia. The species is abundant and when bred in captivity.